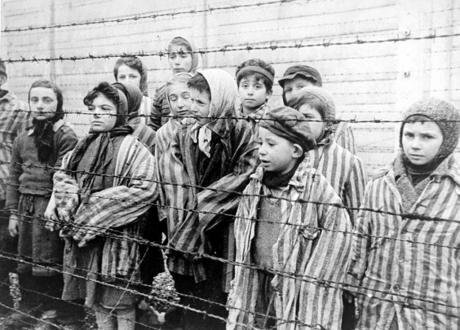 Child survivors of Auschwitz, wearing adult-size prisoner jackets, stand behind a barbed wire fence. Public domain. “A country is not only what it does but what it tolerates”. I first came across the Holocaust when I was fourteen years old. I misidentified Maus for a common graphic novel, and I bought it during one of my weekend trips to the bookshop downtown. It was a difficult read, oblivious as I was to what motivated the war and the atrocities committed by the Third Reich. It took me some time to realise what the author was getting at by depicting the Nazis as cats, the Jews as mice and the Polish as pigs. The whole root of the trouble was that they looked like animals, but they were people. The victims, the perpetrators, and the bystanders were complex and unpredictable, capable of the best and the worst, of sacrifice and betrayal. The whole concept of the Holocaust didn’t sink in until I read Anne´s Frank diary. Whereas Maus challenged how I understood the world, her diary changed how I perceived my place in it. If a little girl could be sent to die in a terrible place, away from her family and friends, I wasn’t sure fascism couldn’t arrive at my country and claim my life. At an unspecified moment, the issue was lost in one of the many regions in my mind. But it was never forgotten. My last high school paper was about the Holocaust. And before finishing college, I was determined to know more. I suppose my curiosity as a novice political writer, tempered by my still insipid sense of political responsibility, made it impossible for me to postpone the visit any longer. Reading Primo Levi's If This is a Man confirmed my commitment, and I made up my mind to visit Auschwitz the following year. The memory of the Holocaust is fading, and our conscience is becoming dormant once more. It was a chilly winter day. I exited the bus without a word. There was nothing I could say. There was nothing my friends wanted to hear. More than 1,1 million people were starved, tortured, and murdered in that dark, windy region of southern Poland, near Oświęcim. We left behind the “Arbeit Macht Frei” sign and made our way into the camp. The silence was unbearable. And as we approached the end of the block’s yard, where thousands of prisoners were shot dead, we were reminded of what intolerance can lead to. The visit lasted several hours. It included the main campsite, blocks two and three, the barracks at the Auschwitz II-Birkenau camp, the crematorium, and the gas chambers. The camp forces visitors to acknowledge that this happened, and this is how. Every building has thousands of stories to tell. Every inch speaks of indescribable loss and terrible sacrifice. There´s no forgetting that human madness and indifference made it possible. From the barbed wire to the barracks. From the main gate to the yard. From the gas chambers to the crematorium. You know why you are there. The camp forces visitors to acknowledge that this happened, and this is how. The photographs represent real people, with real names and real families. Rudolf Brumlík, Rosette Wolczak, Lea Deutsch, Benjamin, and Lina Fondane. Men, women, and children separated from each other. People who died for no reason. People who cannot be forgotten. Seventy years after one of the worst atrocities this world has ever witnessed, we want to believe that what happened in Auschwitz-Birkenau, Belzec, Chelmno, Majdanek, Sobibor and Treblinka can´t happen again. We are told that the world is becoming ever more peaceful, and that reason will prevent us from targeting people because of their ideas, believes and birthplace. Most people might prefer this narrative. However, the rise of populism and the collapse of the centre-left are a stern warning that the world is not getting safer for everyone. Inequality is rising, our societies are becoming more polarised, and we behold the global revival of nationalism. Our politicians might have other priorities but as the support for far-right parties and the hostility towards immigrants rises, to look the other way is an insult to the memory of those who perished seven decades ago. The rise of populism and the collapse of the centre-left are a stern warning that the world is not getting safer for everyone. In Italy, the government has pledged to deport five hundred thousand illegal immigrants, manipulating grievances and using human beings as bargaining chips. In Germany, the far-right has grown from a fringe party to an important actor in national and federal politics. In Austria, the Freedom Party has entered a coalition with the government, despite a wave of anti-Semitic scandals, while the anti-immigration Sweden Democrats won eighteen per cent of the vote in the last general election, despite links to neo-Nazi movements. Things don’t look any better in France, where Marine Le Pen compared the sight of Muslims praying in the street to the Nazi occupation during World War Two. In Hungary, the president has said that he does not want his country to be multi-coloured and promised to protect it from Muslim migrants. And in Spain, a far-right party won twelve parliament seats in a regional election for the first time in decades, being congratulated for doing so by a former Ku Klux Klan leader. Many believe that disaster is still far away from Europe´s doors. However, according to a CNN poll published in November, the memory of the Holocaust is fading, and our conscience is becoming dormant once more. A third of Europeans say they knew little about what happened in Auschwitz. In France, one out of five people between eighteen and thirty-four years old claim to have never heard of the Holocaust. And according to the same poll, ten per cent of Europeans admitted having unfavourable views of Jews. Thirty-seven per cent said the same about Muslims. Thirty-six per cent admitted having unfavourable views of immigrants. As Camus predicted, the end of the war was not a definitive victory against madness, tribalism, and fascism. The struggle will have to be waged over and over again. 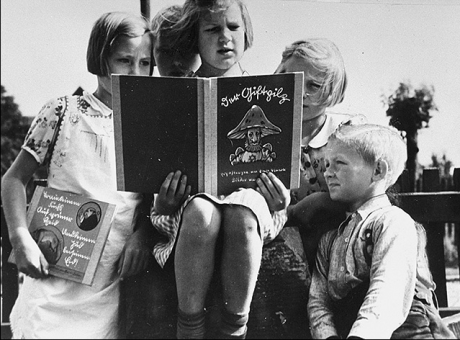 German children reading “The Poisonous Mushroom”, a book intended as anti-Semitic propaganda. Photo Tractatus/Flickr. Some rights reserved. It should be obvious that no one hides in the heart of occupied city unless they have an alternative, just as no one decides to cross the Mediterranean with their children unless they are desperate. Anne Frank died because her family was unable to get visas to leave for America; she died because the west was indifferent to her suffering. In Europe, indifference to suffering become a sensitive subject after the war. Politicians and scholars realised that young people had to know what happened in concentration camps, who was persecuted and the dangers of exclusionary policies. Symbolic places and memorials were built to honour the dead. And to remind the living that we are never far away enough from the next disaster. Visiting the camp should be a mandatory stop for every European citizen, reminding us that moral courage requires empathy, conviction, and bravery. Schools have a responsibility to further their students’ knowledge and help them develop a moral compass that allows them to navigate the contaminated waters of public discourse. Colleges shouldn’t be only four-year intelligence tests; education is also about personal growth and social responsibility. Visiting concentration camps and symbolic places may help students acknowledge the risks and consequences of the lack of tolerance, the value of pluralism and the dangers of remaining indifferent in a democracy. Because democratic institutions depend on values, and values can only endure if they are defended, cultivated, and taught. If we expect our children to lend a hand to people in need, instead of turning away, we can´t forget our history. Nor can we allow others to rewrite it. Colleges shouldn’t be only four-year intelligence tests. Education is also about personal growth and social responsibility. The Holocaust and the targeting of millions of people during the war was not an accident in history. It was not an isolated episode of human madness and cruelty. It started with words and hate. It was fuelled by division and intolerance. It was allowed by fear and indifference. And it will happen again if we don’t prepare our children to resist the rhetoric of charlatans that place their interests over human lives. It was by reading about the life and times of Vladek Spiegelman in Maus, a life-changing book, that I first realised that human beings are capable of anything. It was thanks to the silent despair of Primo Levi, who slept in a bed too narrow for him to be afraid, that I made up my mind to learn more about the Holocaust. And it is because of people like Chiune Sugihara and Irena Sendler, who refused to ignore the suffering of others, that I keep believing that this is not an inevitable defeat, but an endless lesson. Democratic institutions depend on values, and values can only endure if they are defended and cultivated. There are no words to describe what is like to enter the camp. To visit the barracks and the gas chambers. Nothing prepares you to see tons of human hair, decaying in a vitrine and turning to dust. To learn that between 150.000 and 200.000 children died in Auschwitz from 1940 to 1945. But visiting the camp tells us more about ourselves than we could ever suspect. And should be a mandatory stop for every European citizen, reminding us that moral courage requires empathy, conviction, and bravery. It was in the middle of empty canisters of Zyklon B poison and hundreds of hairbrushes and toothbrushes that I finally understood what Anne Frank meant when she wrote that a single candle can both defy and define the darkness. Hopefully, we will never allow that candle to be put out.